To J.E. 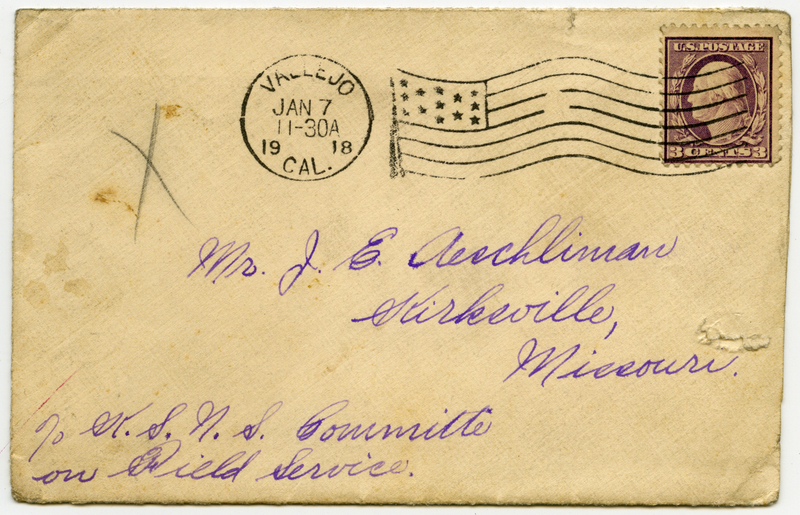 Aeschliman, Kirksville, MO. Henry C. Gardner was a student at the First District Normal School in 1916. 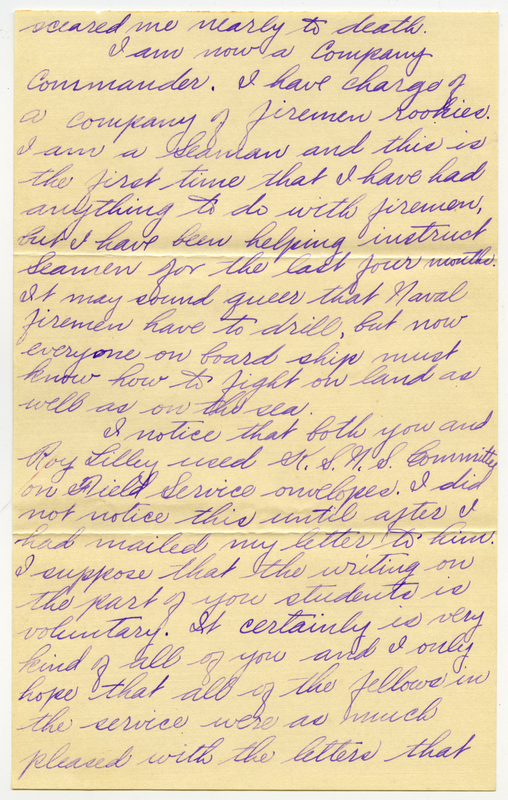 He was a member of Phi Lambda Epsilon, an educational fraternity, and voted a “Class Live Wire” in 1915. Gardner is photographed in the 1915 Echo with the Elementary Class; he sits third from the right on the second row. 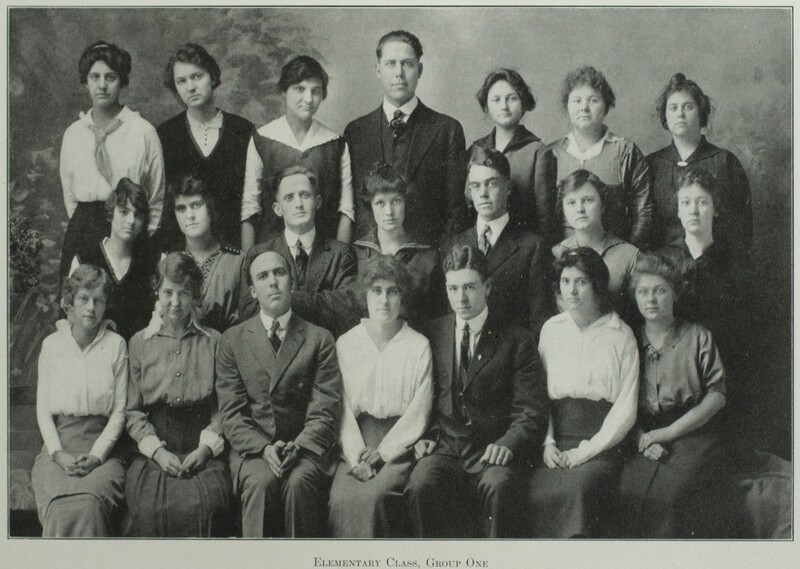 Elementary Class from the 1915 Echo. Page 64. 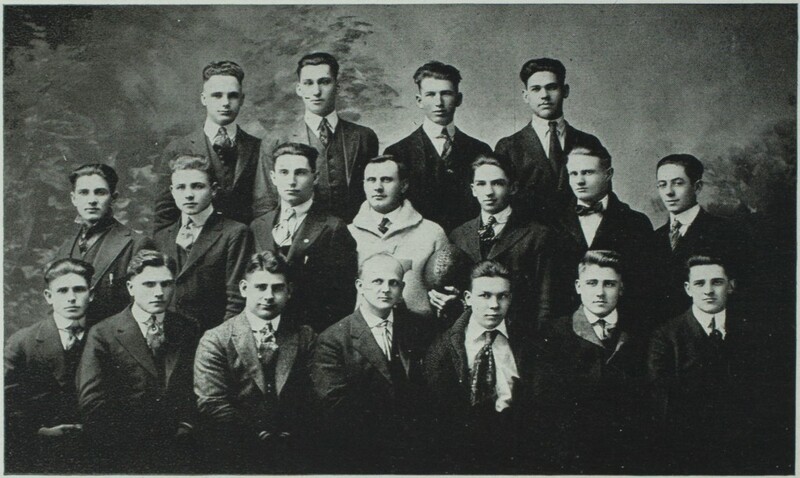 The 1917 First District Normal School Football Team from the 1918 Echo. Page 80. 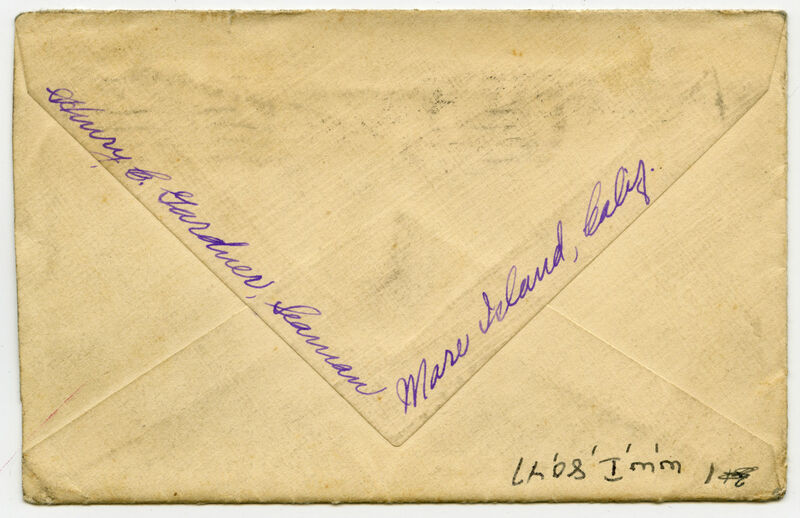 I just returned from a very pleasant trip to Kirksville, where I spent six days indlucinding Xmas, and among tho letters that were here for me on my return, was the one which you wrote. It is needless for me to say that I was very, very much pleased to hear from one who has flew one of my friends for years, and who has been a team-mate with me in many hard fought games both on the gridiron and at basketball. You know Aeschliman there is a peculiar friendship which exists between fellows who have fought together on the football field, which is unlike any other friendship in the world. Yes I read, with much interest, the newspaper accounted of your games last fall. Of course I was very sorry to hear of the defeats you boys met last fall, but I am sure that you all did as well as could be expected. No one knows better than I, that it is impossible to develop a winning team from so much green material. But keep this material together and we know from experience what it can be developed into. I did not see you when Iwas home Xmas, so suppose that you must have been out of town. I would like to have visited school but it was not going on when I was there so didn’t get to see many of the boys. 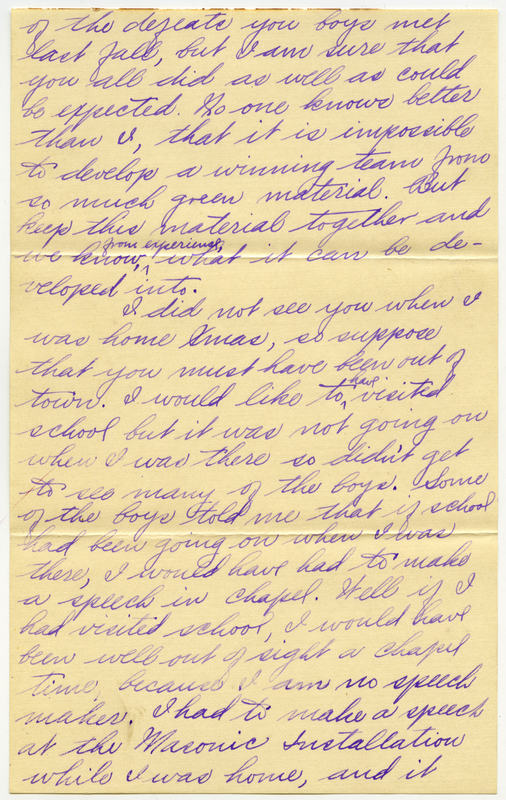 Some of the boys told me that if school had been going on when I was there, I would have bad to make a speech in chapel. Hell if I had visited school, I would have been well out of sight at chapel time, because I am no speech maker. I had to make a speech at the Masonic Installation while I was home, and it scared me nearly to death. I am now a Company Commander. I have charge of a company of firemen rookies. I am a Seaman and this is the first time that I have had anything to do with firemen but I have been helping instruct Seamen for the last four months. It may sound queer that Naval firemen have to drill, but now everyone on board ship must know how to fight on land as well as on the sea. I notice that both you and Roy Billey used K.S.N.S. Committee on Field Service envelopes. I did not unnoticed this until after I had mailed my letters to him. I suppose that the writing on the part of your students is voluntary. 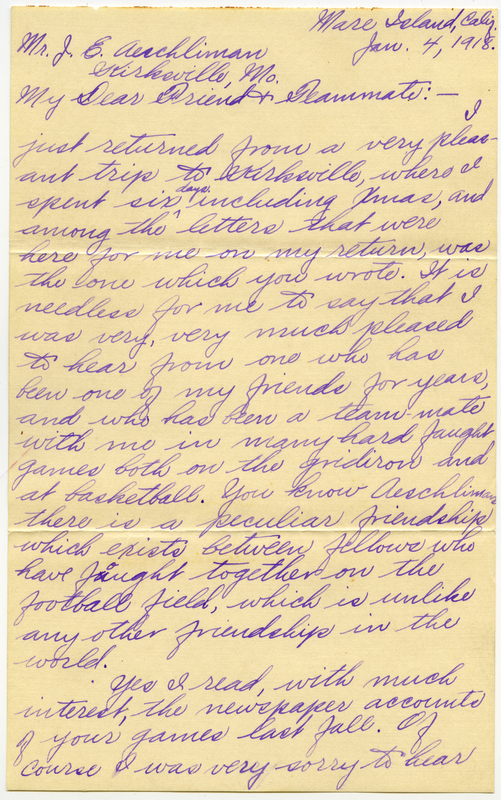 It certainly is very kind of all of you and I only hope that all of the fellows in the service were as much pleased with the letters that they received as I was with the ones from you and Roy. That was too bad that your foot kept you over of the service. I remember it used to bother you some in basketball. The Navy has a very rigid examination. A.C.Corbin (?) 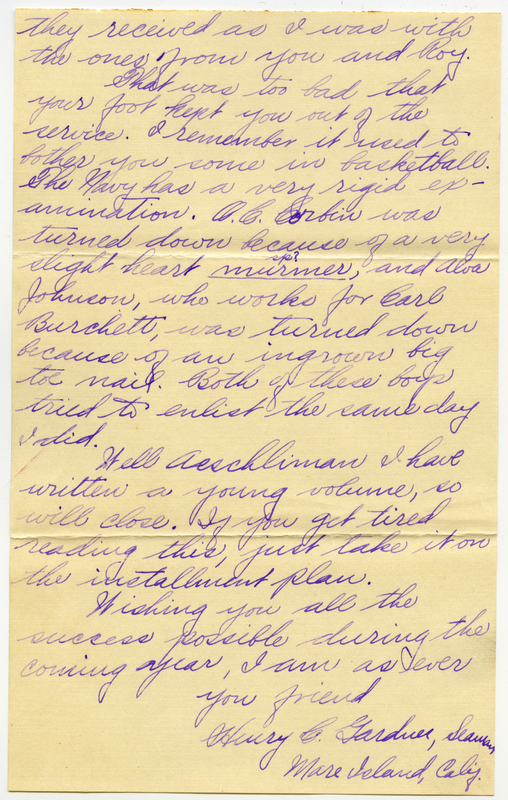 was turned down because of a very slight heart murmur, and also Johnson, who works for Earl Burchette, was turned down because of an ingrown big toe nail. Both of these boys tried to enlist the same day I did. Hell Aeschliman I have written a young volume, so will close. If you get tired reading this, just take it on the installment plan.